In my blog post Experimenting with English: scaffolding learner autonomy, I discussed how I approached helping my learners to use English outside the classroom, drawing on learner autonomy theory and methodology (e.g. Benson, 2011; Oxford, 2003; Smith 2003). Central to that project, alongside the very important element of discussion, was a handout I created for my learners. 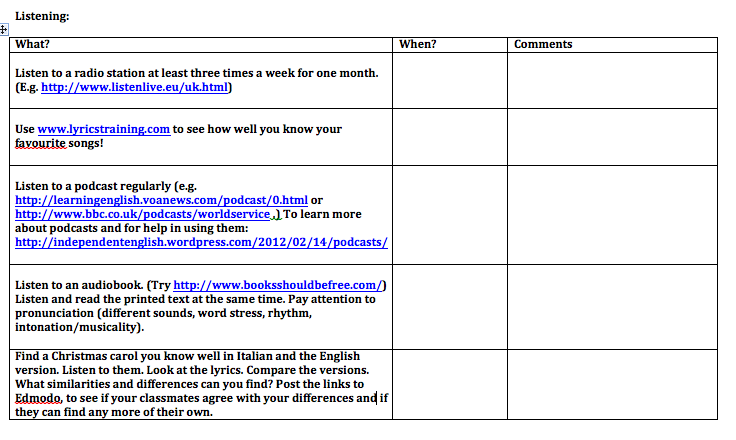 Sample page from my Experimenting with English activities handout, listening section. As you can see, the handout consists of a series of activities for learners to try, with space for them to record when they tried it and what they thought of it. The handout is divided up by skill (reading, listening, speaking, writing). What you can’t see here is that in each subdivision, as well as the activities I’ve added, there is space for the learners to add their own ideas. I have two versions of the handout, which you can access below, one of which is aimed at the learners I use Edmodo with and one of which is aimed at the learners I use a WordPress blog with. Both handouts are geared towards a non-English speaking environment, and towards adult learners of General English, reflecting my current context (a private language school in Palermo). it means you can remember what you tried and how useful/difficult/interesting/boring/helpful etc. you found it. if you try an activity more than once, at a different time, you can see if your opinion of it changes or if it gets easier to do. after some time, you build a record of what you have done and you can look back to see what progress you’ve made. Of course, my learners are busy people and the time they have for out-of-class study is limited. And sometimes that limited amount of time becomes zero time, because other things take over. It’s important to be understanding of this. And, equally, to be enthusiastic when they do manage to do things. These handouts are just prototypes. I created them to fulfil a need I identified while working on my autonomy fostering projects, and they’ve been useful for that, but I want to work on them: add activities and improve both the handout and how I use it in class, based on what I’ve learnt during the last 7 months, so that they will be more effective when I use them next academic year (yes, I shall be back in Palermo again!). Additionally, of course such a handout in a different context, for example an English-speaking environment, would look different and include additional different activities, geared towards helping learners mine that resource effectively. This entry was posted in Classroom Talk, Learner Autonomy and Metacognition and tagged activities, authentic input, learner autonomy, metacognition. Bookmark the permalink. Really enjoyed this idea of creating a chart for students to use. Each week we talk about what English they have listen to or read during the week, but this would be a big help. I especially like the place for them to record comments. Thanks for sharing your ideas! Another great post, Lizzie. Thanks a lot! The handout provides a clear structure that is much easier to discuss and feedback on with the students. I’ll definitely give it a shot, because I’ve noticed that just recommending how and where to study outside the class doesn’t work. Most students just forget your advice or ignore it. There are also so many resources on the Internet that it might be really tricky for students to choose the right ones. Also, since there will be a feedback stage at which the student has to show you what they studied, it’s a bit more likely that they’ll actually do it. Thanks for sharing your knowledge,experience,passion and inventiveness! !I love what you do!! A great wan to push students to do more outside class. This is an incredibly amazing blog, Lizzie, I could be reading it for hours on end. But I’ve decided to write a comment because I found this page when looking at your learning Italian contract, thinking I’d take your goals as suggestions for my students (I’m also trying to keep learner’s autonomy in mind for next school year) and, lo ho! I find you’ve already written out what I was just beginning to draft, collecting the sites I’ve recommended my students more recently. Not only that, you’ve also reflected on the need of not being happy with just giving them the handout, avoiding me the pain of going through the recommendations over and over and watching them do nothing about it. I can’t thank you enough! As you can see I’m all excited about preparing my next school year, and that’s partly thanks to you (and partly to the EdmodoCon I attended yesterday). So thankyou, thankyou, thankyou, Lizzie. Thanks for the lovely comment, nice to see someone as enthusiastic as I am about learner autonomy! 🙂 Your projects sound interesting, I hope it all goes well. I like the Wordle idea. If you ever feel like doing a guest post about your projects, for my blog, I’d be very happy to host it! Lizzie. I’m really enjoying reading about your posts on encouraging learner autonomy, especially the practical tips on how to turn the theory into a reality in (and outside) the classroom. I like the fact that you can really adapt the handout to fit the level and interests of the students. Most of my adult classes only have 90 minutes of English a week and I’m really keen to encourage them to take learning into their own hands. You’d be surprised how many of my students don’t know about the simplest of online resources, e.g. Cambridge dictionary or that there’s even a little button you can press to hear the pronunciation! Thanks for you great ideas, Lizzie! This will help me a lot in order to improve my teaching skills. thanks a lot.